First of all I really love this cool w7 packing! When you open it you see 12 beautiful colors. In this set you also find a lip brush. This is a good brush with two handy sides. The 12 colors are so different, you have 6 glossy and 6 more glitter/metallic colors. Of course the most important of all… How do these colors look on the lips. So are you ready for much lip swatches from the 12 colors? Caution, is a dark brown color. Veronikais is a difficult color to describe. In every light it looks different. Then more brown and in the other light more purple. So let’s say that this color is a special but pretty brown, purple color. Loved up! is a more brown, red/orange color. In the color Izabela is see subtle a little brown but mostly pink. Auntie Sandra is the real brown color…. It’s not my favorite one but I can understand that lovers from brown colors will love this one! Party dress is after the light brown color the darker chocolate brown tint. It is a hard color the get equal on the lips, as you can see you still see the red from my lips. So that was it for all the glossy lip colors, now it’s time to show you the metallic colors. First we start with, Ewelina. This is a very special color. It’s a golden metallic lip color but I still see the red from my lips through it and that makes this color more special! Legs 11, is personally one of my favorite! It’s a nice, dark red almost bordeaux metallic color. Perky is a very special brown, bronze color. Tweet is a hard to describe, but I would say that it is a pink color with some brown in it. Flying high is also a bit bronze but it is a more golden color. Girl power that’s of course an amazing name but I also love the color! 😉 It’s a very dark mysterious bordeaux red color. 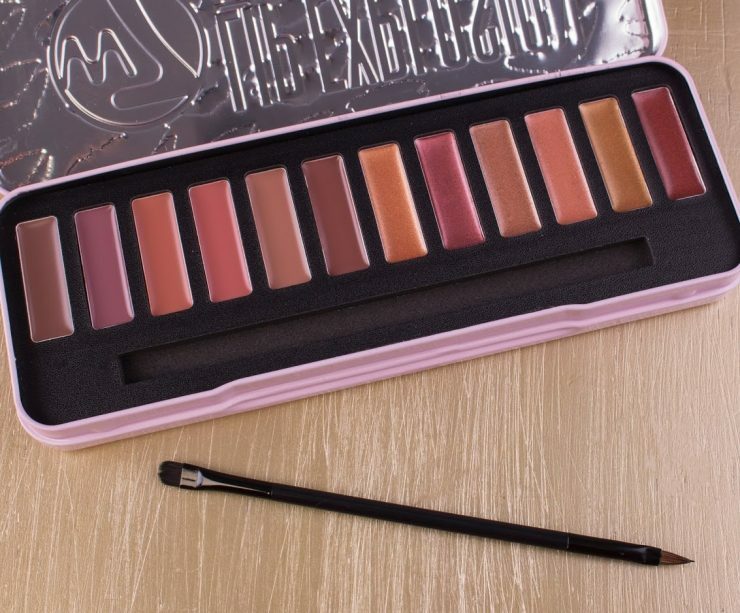 This w7 lip palette contains 12 very special and pretty colors. You can easy experiment with this palette and make your own unique lip color. So for the ones that love a pretty lip color is this palette for sure a nice item! Also if you are interested in a make-up education or just love to do the make-up from someone else, then is this palette a good item because you got a lot of different colors in it! The quality from the colors is good. You can easy build up the pigmentation and they are easy to apply. The colors don’t stay very long on the lips. But all with all is this palette much fun to experiment with it! This w7 lip explosion, lip colour palette with 12 colors cost €7,95. So that is for sure a good price for this lovely lip palette! Wauw! Die verpakking is awesome! En de kleuren staan je ontzettend mooi.